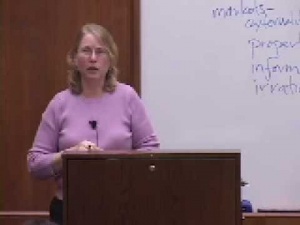 In this course, Professor Holly Doremus gives 20 video lectures on the concepts of Environmental Law and Policy. This introductory course is designed to explore fundamental legal and policy issues in environmental law. Through examination of environmental common law and key federal environmental statutes, including the National Environmental Policy Act, Clean Air Act, and Clean Water Act, it exposes students to the major challenges to environmental law and the principal approaches to meeting those challenges, including litigation, command and control regulation, technology forcing, market incentives, and information disclosure requirements. With the addition of cross-cutting topics such as risk assessment and environmental federalism, it also gives students a grounding in how choices about regulatory standards and levels of regulatory authority are made. The original name for this course is: Law 271 Environmental Law and Policy. Holly Doremus in Lecture 2: The Role of Values. boudj wrote 9 years ago. Thank you for those lectures Holly.